I have to confess, I’m coming at you guys with literally no preconceived notions or personal knowledge of what Spiral Zone is all about. Actually, that’s not quite true; for some reason I can still sing the cartoon theme song, even though I have no recollection of ever actually seeing the show, and I know I never owned any of the toys. Anyway, apparently not satisfied with manufacturing giant metal blunt-force trauma inducing trucks and construction vehicles, Spiral Zone was Tonka’s attempt at getting a piece of the already crowded 1987 boy’s toy market. 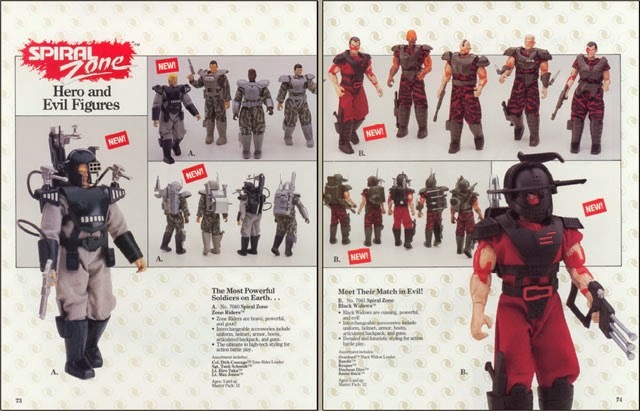 '87 was a weird year for action figures. Out of the big lines of the 80’s, Star Wars toys were already relegated to the discount aisle; G.I. Joe became a lot less realistic and a lot more strange and colorful (Cobra-lalalalalalalala); Transformers got more gimmicky by introducing Headmasters and Targetmasters; the Masters of the Universe line was petering out, even with the movie characters and Preternia dinosaurs being added to the mix; and Thundercats was on its last wave of figures, also about to vanish into nerd-nostalgia obscurity. The Ninja Turtles were still a year away, and one would think that the field was ripe for some new properties to grab a nice chunk of the market. Spiral Zone was not one of those properties… unfortunately so, because according to my research, Spiral Zone seemed like it could have been pretty cool. Especially if you're into color-coordinated teams. Spiral Zone was a science-fiction story set in 2007. Rogue military scientist Dr. James Bent, hijacks a space shuttle and drops his deadly Zone Generators across half of the Earth. This creates a region called the Spiral Zone (due to its shape). The area infected by the Zone has dark skies, and a proliferation of “zone spores” growing all around. The people trapped in the Spiral Zone are transformed by the spores into "Zoners"; (essentially zombies) with lifeless yellow eyes and red patches on their faces. Because they have no will to resist, Dr. 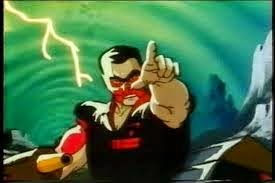 Bent – who now calls himself Overlord - makes them his slave army and controls them from the antenna on the Chrysler Building. His followers call themselves the Black Widows. They are Bandit (a Middle-Eastern terrorist master of disguise), Duchess Dire (an assassin and criminal mastermind), Razorback (an expert with bladed weapons), and Reaper (a former bounty hunter). The Widows are immune to the effects of the Spiral Zone because of a special device called the Widow Maker (clever!). However, due to prolonged exposure to the Zone, they also share the same visual effects as Zoners. Overlord’s goal is the typical 80’s villain fare - conquer the world by bringing everyone under control with the Zone Generators. The Zones feed off "human energy", which is a neat way to explain why Bent does not kill anyone inside. Overlord's initial strike puts all the major capitals of the world under the influence of the Spiral Zone. The chaos caused by this leads to international cooperation, even between the United States and the Soviet Union (remember kids, this before Rocky Balboa ended the Cold War). To counter the effects of the Zone bacteria, British scientists create a rare material called Neutron-90. Of course, only a limited amount of Neutron-90 is remaining in the world after the British government orders the destruction of the only laboratory where the material is produced for some reason (goddam limeys). Only enough Neutron-90 remains to build combat suits for five specially-trained soldiers called the Spiral Force, also known as the "Zone Riders." Commander Dirk Courage - the Zone Riders leader from the United States (apparently, his parents, like the parents of most 80’s toy heroes, knew he would grow up to lead the Zone Riders when they named him); Master Sergeant Tank Schmidt - a heavy weapons specialist from West Germany (a heavy weapons soldier named Tank! Ha! ); Lieutenant Hiro Taka - an infiltration specialist from Japan; 2nd Lieutenant Max Jones - a special mission expert from the U.S.; and Corporal Katerina Anastacia - medical officer from the USSR. As the series went on, the Zone Riders discovered that there is still enough Neutron-90 left over from assembling the five suits, to build two additional suits. They are issued to Australian demolition specialist Lieutenant Ned Tucker, and field scientist Lieutenant Benjamin Davis Franklin. Also, French scientist Jean Duprey and truck driver Richard Welt would later join the Black Widows. They were codenamed Crook and Raw Meat, respectively. The toys themselves were essentially 7” dolls. Tonka (taking a cue from what Hasbro did with Transformers) licensed the toy rights from Bandai. The figures had cloth uniforms and plastic armor. Unfortunately, the series was cancelled before the figures of Anastacia, Tucker, Franklin, Black Crook and Raw Meat could be made, but they were planned, as was a Zone Generator playset (prototypes were shown in Tonka's 1988 catalog). The figures were also highly detailed, but were not as articulated as the Japanese versions. Each figure came with a special audio cassette tape too. It’s notable that there were more villains than good guys released in the first wave of figures as this is extremely unusual for pretty much any toy line ever. The vehicles were large and cool-looking. Commander Courage drove the Rimfire Cannon, that wheel-looking thingy that suspiciously resembles General Grevious’s vehicle from those “Star Wars” movies. Overlord drove the Bullwhip Cannon, which is that thing with the eight wheels. 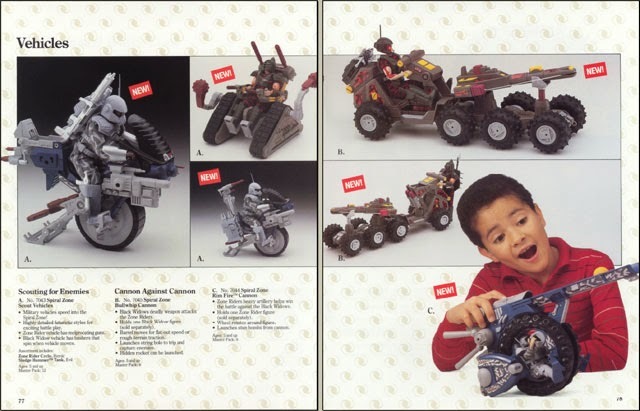 The other two vehicles, the Zone Rider Cycle and the Sledgehammer Tank were the non-leader figures means of transport. The Zone Rider Cycle is easily the coolest of all of these for my money. They also released eight weapons packs and six alternate outfits err, uhh uniforms... in case you want to play dress up with your Spiral Zone dolls, Mary. I’m going to have Overlord put on his swank purple number before he conquers the planet! 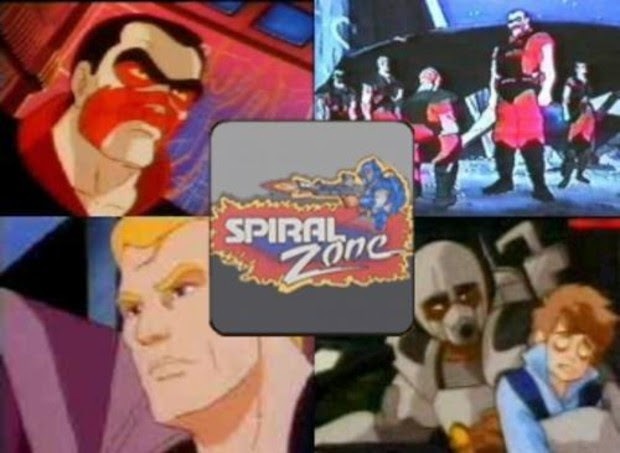 Despite the series being developed by none other than J. Michael Straczynski (under the pseudonym Fettes Grey), and being supported by a cartoon that ran 65 episodes, and a DC comic book that lasted 4 issues, Spiral Zone became yet another property interred in the cemetery of forgotten 80’s toy. And, if you’ve been following TYB… WB, then you probably have already figured out why. These things were large, and as a result took up lots of shelf space, meaning stores were less willing to stock them. Sure Thundercats were larger, but they were blister carded and could be hung on hooks. 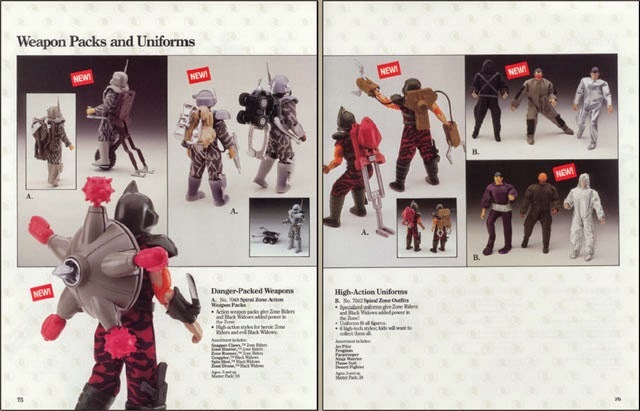 Spiral Zone figures came in a bulky box, which took away valuable real estate from better-selling lines. The larger size also meant a larger price point, which means parents are automatically steered away. I’ve been beating this drum for many articles now, but when you can get five or six G.I. Joe figures for the price of one Spiral Zone doll, it’s a no-brainer for wallet-conscious adults (a.k.a. chiselers). 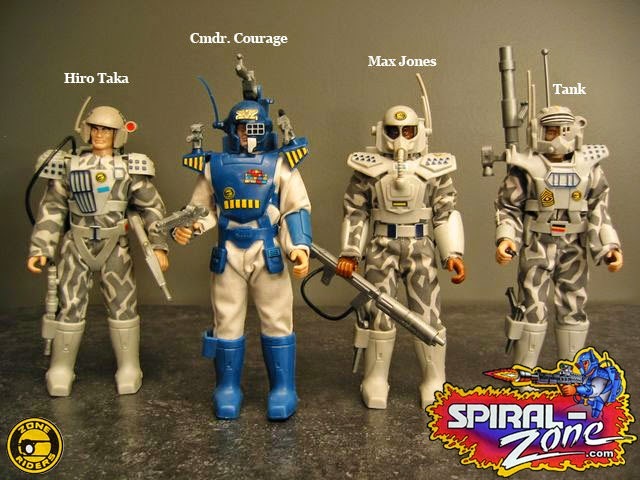 Additionally, let’s be realistic, after nearly a decade of being accustomed to action figures NOT being dolls, Spiral Zone didn’t catch on because well, they were. And, they were really bland and boring to look at besides. All the accessories and posh outfits notwithstanding, all of those figures up there look like slightly different versions of the same two guys. At a time when G.I. Joe was getting way brighter and more colorful, this just wasn’t going to fly. It's not only bad for aesthetic-conscious kids but also for semi-disinterested grown-ups, who aren't going to take the time to tell two nearly identical toys apart. They're just not going to buy one figure that looks just like the other, thinking they're the same. 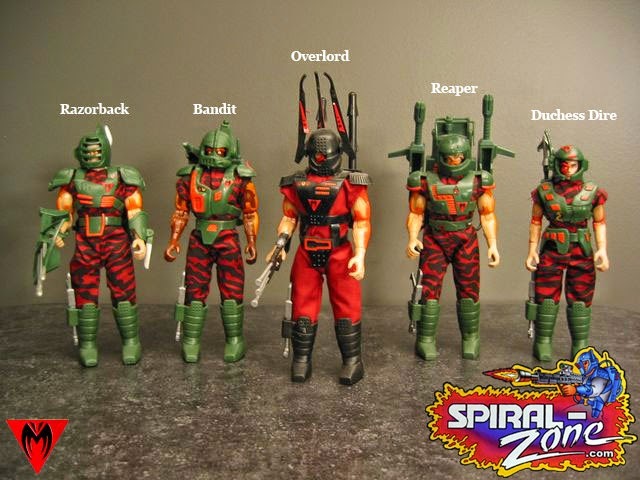 Thus died another toy line... which is a shame because if nothing else, Spiral Zone at least had a catchy theme song! Great post about a toy line I had no idea existed. I love the gear and vehicles.